In an era of rapid growth of mega-farms, the encroachment of suburbia and new European Union rules and reductions of agricultural subsidies, the farmers in the Périgord region of southwest France are forced to confront challenges that threaten the very existence of their small farms. Their story is recorded by one of their neighbors, an American filmmaker who grew up on her family's farm in Pennsylvania. Inter-weaving her story and theirs, the documentary explores the nature of the farming life and the rapid changes of the last two decades that have impacted the lives of families whose survival is tied to the land. "I love this film. After Winter, Spring is a beautiful and intimate look into the lives of contemporary French peasants who heroically struggle to maintain the dignity of traditional, tactile ways in an age of EU homogenization. It makes a compelling case for reimagining the policy assumptions that take us down a no-exit pathway for larger scale, increased efficiency, and standardization...Must see! Must share with USA farmers whose link to traditional practices has faded. This is an important and original film." "In the decades to come, After Winter, Spring could serve as an important record of the world's transition from one era to the next. If we're lucky, the film will also inspire a sense of urgency in today's audiences, as they consider what they want from their food systems." "With beautiful imagery and poignant narration, the film makes it clear that the caring for field and fowl are really issues of the heart and staying connected to the land is vital to our understanding of what it means to be human." "A cinematically beautiful, heartwarming, sometimes discouraging, and sometimes optimistic look into the lives of the region's farming community...It elicits a recognition that we are part of this rhythm, connected to people and the natural world in all times and in our own place." "Uplifting...This beautiful film will be remembered long after viewing; recommended for all audiences." "Highly Recommended...An honest and realistic contribution to public awareness of the major issues related to small-scale farming...Can be used to bolster discussions in subjects related to sustainable agriculture, business, globalization, small-scale farming, and preservation of local identity." "Make no mistake, this film doesn't only speak of loss and disillusionment, but also of renewal and a perhaps even of hope." "The film is never less than a pleasure to watch." "The stunningly beautiful landscape of the Périgord region of France provides the backdrop to this story about the changing face of small-holder agriculture in modern Europe, as seen through the eyes of the region's farmers. The parallels to American agriculture are impossible to miss. The insights these farmers offer about the business and lifestyle of farming, the challenges created by large scale, industrial agriculture and EU regulation, as well as their individual solutions to them, speak to the indomitable character and perpetual optimism of farmers everywhere, so effectively articulated by the title, After Winter, Spring." 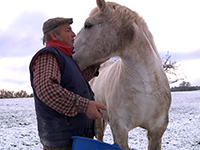 "After Winter, Spring is a beautifully shot film that takes complex issues of a globalizing food system and makes them relatable, personable and powerful...The film can make issues like subsidies, development and industrialization salient through the family farmers of the Périgord and their struggles between tradition and change." "How is it possible to speak of this film without underlining the beauty of the landscapes, the sensitive, poetic, and emotional camera that crosses the Périgord." "A tender, thought-provoking, and visually beautiful look at a vanishing way of life. The characters we meet in the film are real human beings with both real problems and a real affection for the land. It is encouraging to see people who continue to cleave to the old ways in the face of the modern threats of industrialization, consolidation, and bureaucratic regulation. The film does an excellent job of explaining the challenges of being a traditional agriculturist in the era of the rapid expansion of both farm size and farm mechanization. Some of the most useful segments of the film are those that document some of the actual processes and procedures of the traditional lifestyle of the rural Périgord. " "A moving portrait of small family farms...Her lens reveals both the tenuous future of farms where the younger generation has moved away, and the reinvigoration of organic farming by young families attracted to a life in touch with nature...After Winter, Spring is a 'must see' for people interested in environmental preservation, farm to table food production, traditional knowledge systems, and the future of agriculture." "Outstanding photography and a compelling story...Through emotional stories of family farmers in the Périgord region of Southwest France, we are confronted directly with the challenges the world faces in providing healthy food without decimating the environment."